We thought today would be an easier/shorter day, but still ended up with a long day riding on a wide assortment of roads. For 42km we were on asphalt. Some of the rest was hardpacked road with loose gravel on top. We had a mix of everything in between. We started the day on pavement. The road was a fairly recent concrete road with some tar/asphalt on top. It went via some gentle hills but otherwise through the forest. At 26km we had a turnoff to Магдагачи for 5km. We thought there might be a cafe at the next turnoff. However, nothing at next turnoff and road turned to gravel. In the next stretch, they were busy with construction. One short stretch of loose gravel we walked, but most were good to ride with a variety of sand, gravel, graded gravel and rock surfaces. At 64km, we came to turnoff to Дактуй. We were told this village had a store but not much else. They also said the road would improve. So at 68km, we made our own lunch stop not far from a bridge still being constructed. Shortly thereafter, the road became worse. It was a combination of hardpacked surface with areas of loose gravel. I found this particularly tough to ride. 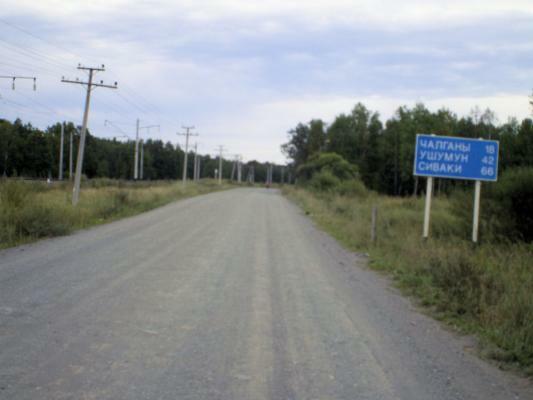 By 84km, we came to turnoff to Тыгда and were surprised to say it still said 14km to go. 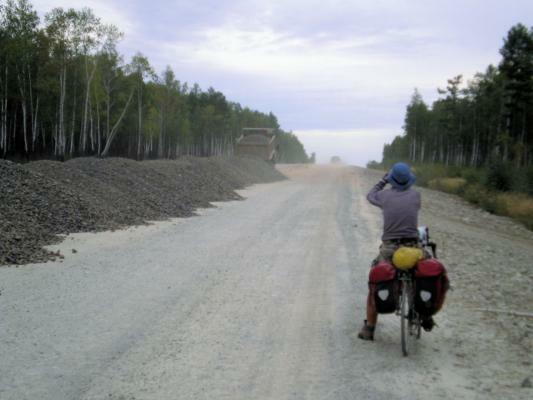 However, the road to town was paved and the road ahead had a new layer of gravel spread out. So, not a tough choice. We cycled to Тыгда and found a nice center of town with shops, railway and cafй. We refilled on everything and camped a short distance south of town. Tomorrow plan is to try the old road.